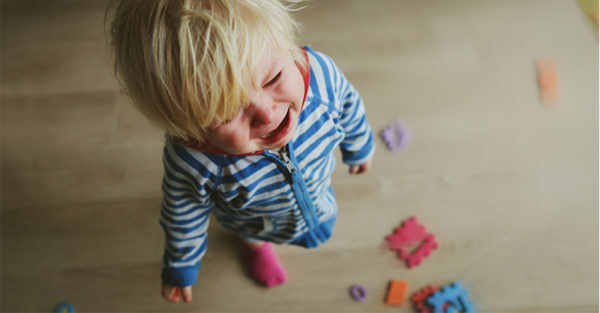 No one really wants to discipline their child, but as mothercraft nurse Chris Minogue explains, discipline is absolutely fine for toddlers and is also essential for their development. Our gorgeous 21-month-old has a habit of upturning a bowl of porridge onto his head and then throwing it across the floor. It’s cute the first time. The tenth and eleventh time? Not so much. When my husband suggested putting him in the cot for a few minutes, my tummy got that funny feeling when you’re not so sure. Was that a bit harsh? He’s not even two, I thought to myself. But then again, there was no way I wanted to be doing THIS every morning. Kinderling Helpline’s mothercraft nurse Chris Minogue says discipline is not only okay for toddlers, but it’s also essential for their development. That said, getting the right process can take a bit of thought. NB: For this article, we’re defining a toddler’s age as anywhere between 14 months to three years old. “As toddlers develop they’re looking for us to give them guidance, boundaries and support around their behaviour – be it in a social setting or in a family. Why do kids lie, and when should parents be concerned? “When you look at out-of-control behaviour, focus on the main thing you want to change, because you can’t pick all the battles all at once,” says Chris. Behaviours you will ignore. Maybe little things like throwing his shoes on the ground or (my personal favourite), kicking his legs while you’re trying to change his nappy. Behaviours you remove/distract them from. These could include banging on the TV screen or reaching for a drawer with knives in it. Behaviours you will give a time-out. For example, when he is hurtful to another person, running away or having an utterly out-of-control tantrum, etc. Behaviours you withdraw them from. If he psychically attacks or pushes another child in the park, you just put him in the car and take him straight home. When disciplining in a park, it’s hard for a toddler to understand precisely what he has done wrong. But he will know if you remove him from the park. He will get that really quickly. Deciding what behaviour you want to discipline, and which category that falls into is entirely up to you. For example, at our place, Lachie’s food-throwing antics are wearing thin, so we want to address it with discipline. Your toddler doesn’t know how to move through life’s experiences, yet. That’s where you come in. Chris does point out that you wouldn’t take the same approach for your older children. You can still give timeouts etc. but the difference here is getting them to own their behaviour. This kind of conversation addresses the behaviour but also teaches your child empathy and responsibility for their actions which is appropriate for an older child. Got your own trick when it comes to toddler discipline? Share it in the comments.